Carly (Laura Wright) revealed to husband Sonny (Maurice Benard) that she was pregnant as confirmed by the positive results on two recent pregnancy tests she’d taken. Sonny was in disbelief as he thought his wife was on the pill. Carly explained that as she considered herself passed the age of childbearing, she didn’t feel birth control was necessary. What followed were very real conversations between a husband and wife regarding health concerns due to her age. Sonny didn’t want Carly risking her life to bring another child into the world. She’d face problems in her pregnancy previously and factoring in her age made the odds possibly stacked against her. 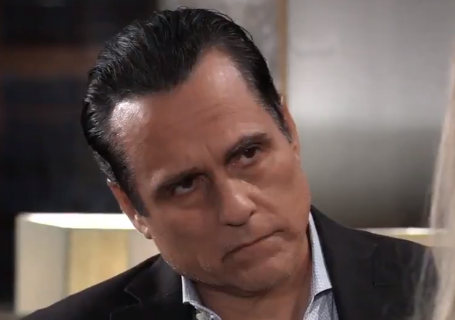 And there was the issue of Sonny’s mob world and business that increased the danger of having a new Corinthos baby. Carly acknowledged that with Michael (Chad Duell) being an adult, Josslyn (Eden McCoy) a teen and Avery (Ava and Grace Scarola) no longer an infant, did they really want to start over. Sonny offered another reminder as to why having a baby may be a bad idea: Morgan. He commented how a new baby that may share a similar appearance to their deceased younger son could be painful. Carly knew everything she and Sonny were talking about was true. But she also knew that even with knowing the danger and how everything would turn out, she’d never trade being a mother. She told Sonny she wanted to have the baby. And in the end, Sonny provided the emotional support of a good husband telling Carly they’d see the doctor first to assess the medical risk. Having a child later in life poses health risk and open parents up to issues younger parents-to-be don’t face. My mother was forty when she was pregnant with my twin sister Tracy and I. Additionally this was in 1964 when the treatment and monitoring of older women carrying babies weren’t as medical advanced with the risk increasing with a multiple birth. I applaud the writers of General Hospital for tackling this important story and for showing viewers such candid discussions between an older couple facing a later in life pregnancy. Carly and Sonny may have wealth and power but that doesn’t protect them from these types of situations. Sonny would do anything for Carly. Even though he can’t ensure a healthy pregnancy for her, Sonny will be with her every step of the way. Well done Laura Wright and Maurice Benard. It’s moments like this that showcase your talent as actors.